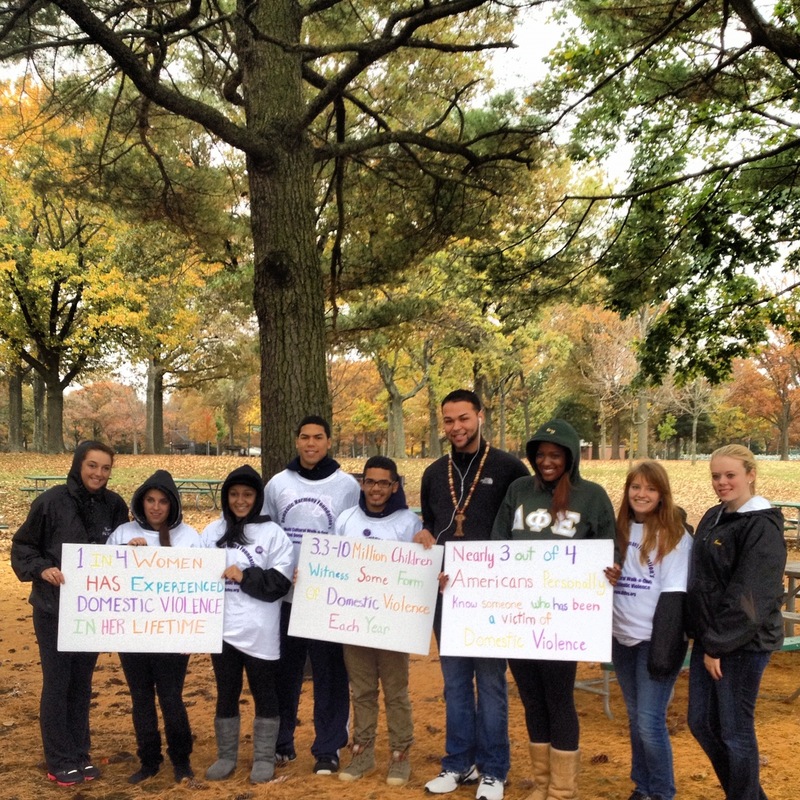 October is Domestic Violence Awareness Month and although it was cold and windy as Frankenstorm approaches, several students went early this morning to Eisenhower Park Field #5 to walk to end domestic violence. 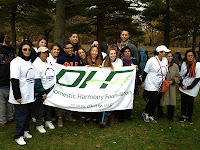 They walked in support with the Domestic Harmony Foundation to bring awareness to the need to end domestic violence in all of our communities. 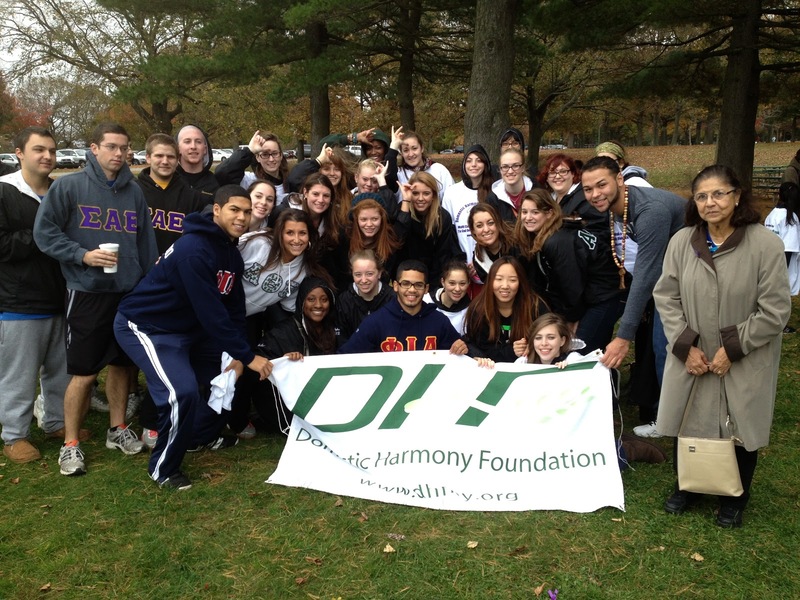 Members of Hofstra's Fraternity and Sorority Life even got there early to volunteer and assist the Domestic Harmony Foundation in setting up the walk before 9am. There were faculty, staff and students from all over campus and it was great to see people energized to educate their community about the harm of relationship and family violence. For more information on other ways you can get involved as a student please call the office of Student Leadership and Activities at 516-463-6914. Everyone stay safe as the storm approaches and continue to watch for more information on upcoming service programming on campus. There are so many ways you can get involved as a Hofstra student in organizations, programs and events on and off campus. For more information on OSLA sponsored programs click here. Thank you to Jose Rivera of Phi Iota Alpha for sharing his pictures for this blog. 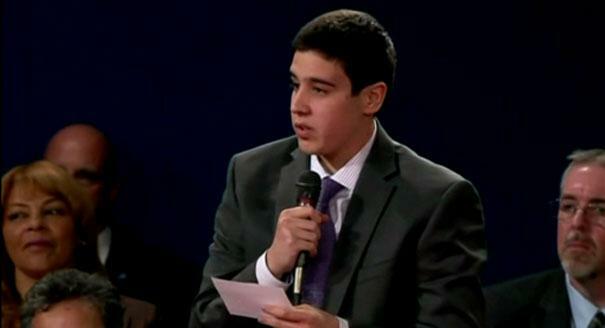 This was the first question of the night, asked by Jeremy Epstein a Long Island student. This question should be and is on the mind of most of you. As a career counselor, I am profoundly concerned about the labor market and our economy, especially here in New York. I am in no means entering into the political debate here. However, what I would tell Jeremy and you is be proactive, work hard, start early, get a job, get an internship, get good – better yet, get great grades, and take advantage of all of The Career Center’s services and events! Right now, there are a group of seniors sitting in The Career Center lobby waiting for interviews with employers – in the building! Next Wednesday we are hosting a Communications Career Fair in Dempster Hall! And don’t be SCARED – we are hosting a Fall Career Fair on Halloween in the Mack Sports & Exhibition Complex! The Diversity Dialogue Desserts (DDD) Series kicked off to a great start. This series consists of programs revolving around diversity and provides a safe space for open discussion and dialogue with the added touch of cakes, pastries and other delicious treats! As part of LGBTQ month, we started off with a DDD entitled “LGBTQ in America Today” which consisted of a discussion touching on several issues affecting the LGBTQ community. 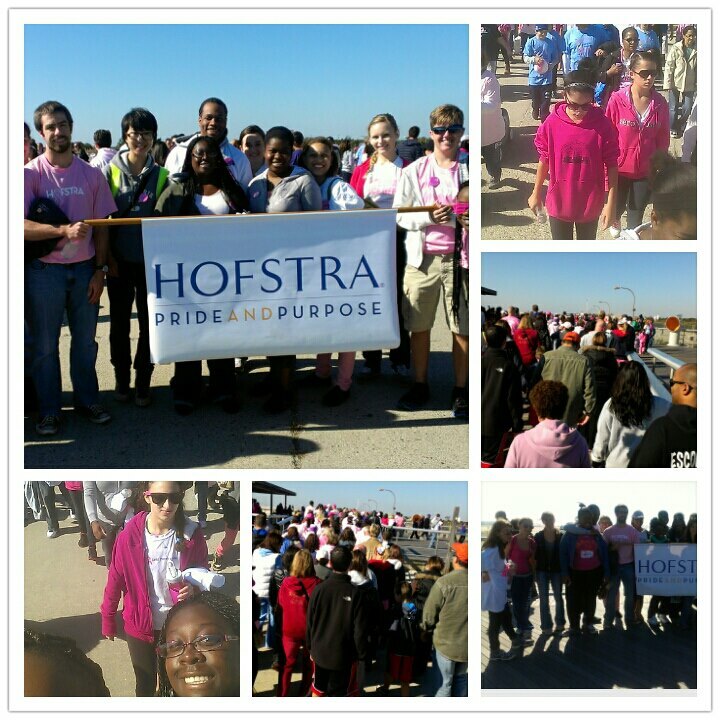 A group of students including members from the Hofstra Pride Network shared their thoughts and experiences. Students from different countries, including the Netherlands and China, provided the international perspective on LGBTQ affairs in their countries. We touched on several areas including the Don’t Ask Don’t Tell legislation, LGBTQ in the media, social media and bullying and structures of support available for LGBTQ community. What an informative and insightful discussion! I am looking forward to our next DDD entitled “Being Part of the American Dream” on Wednesday, October 31 at Common Hour (11:15 a.m. to 12:45 p.m.) at the Plaza Room West in the Student Center, and I hope to see you all there! It’s back! Fright Night returns on Halloween night (Wednesday, October 31, for those who like dates). 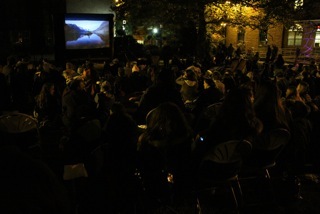 We had such a great time last year and many of you were hoping we would do it again. Well, not only are we bringing it back but we are letting YOU choose the movie. 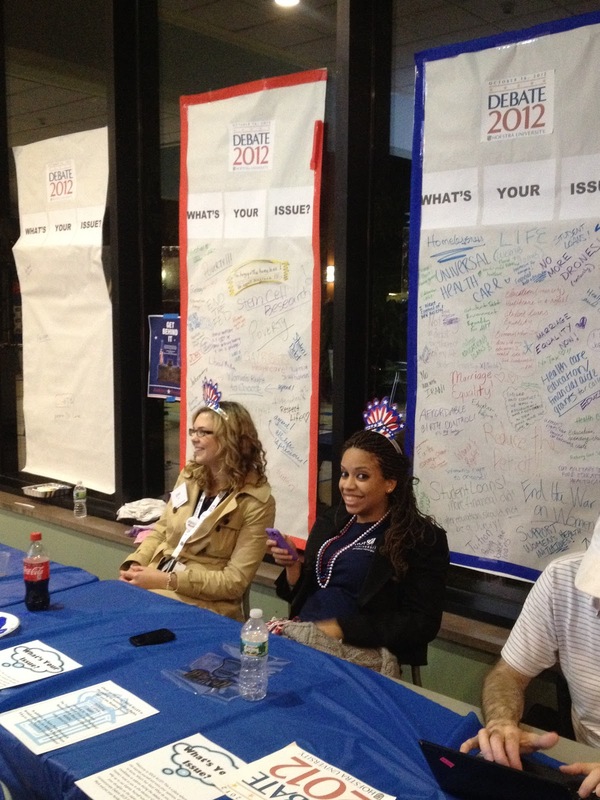 In order to vote, please visit the Hofstra Student Life Facebook Page and choose which movie you’d like to see. Voting ends Wednesday, October 17! A professional pumpkin carver will be on-site to help you create our own jack-o-lanterns. 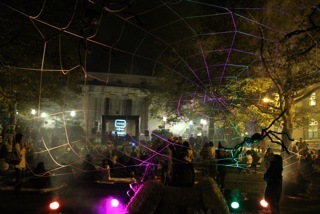 Fright Night will be taking place October 31, 2012 on the Adams Quad, festivities start at 8:00 PM. So bring your blanket and lawn chairs and get ready for a fun Halloween night! This may come as a complete shock for many of you who know me…after all, I live for those long, high UV-index beach days, the sand between my toes, sundresses and flip flops, but for me, there is nothing like the first brisk autumn air; I am convinced that it has its own very distinct smell. I know it seems crazy coming from me, but there is something about the first time my house catches that chill…you know the first time your floors are ice cold under your feet—you’ve got to cave in and put slippers on, OR even better, my first pumpkin muffin of the season…It’s ALMOST as great as the perfect beach day. With the weather finally feeling more like fall, there are so many things I am looking forward to, I figured I’d share! 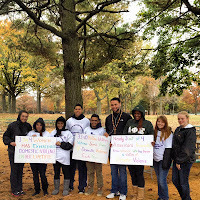 2) Attending Hofstra’s Annual AUTUMN FEST on October 24th, Common Hours, Student Center Main Dining Room. 3) Attempting to bake my caramel apple cookie recipe that took me 5 years (yes, it’s true) to perfect. Side note: I ate A LOT of caramel apple cookies from this little bakery in Delaware Water Gap, PA in order to get this recipe down pat. I did at one point try to pay them for their recipe…but they wouldn’t except my bribe and I was forced to use my taste buds to re-create those cookies! 4) Watching the battle of the classes in a full-out dodge ball tourney on October 24th, 6pm in the Fitness Center. 5) Getting a famous apple pie from Jericho Cider Mill, yum! 6) Decorating a pumpkin outside Bits & Bytes on Halloween (10am-2pm) courtesy of SGA’s programming board! 7) Midnight Madness at Hofstra, GET EXCITED for basketball season to start!! 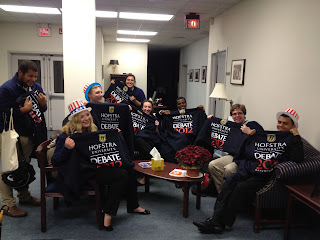 November 1st, 9pm, Hofstra USA. 8) The big halftime performance for Cheer, Dance, and Pep Band on November 17th at the Men’s Basketball game! 9) Pecan and coconut pies on Thanksgiving. 10) Waking up at 4am on Black Friday, buying something at a ridiculously low price and then celebrating my victorious shopping experience by feasting on pumpkin pancakes at IHOP. 11) Pranking my colleague by spraying their office with my fall-scented spray (heavy on the cinnamon) so that he runs around the office complaining about his serious aversion to cinnamon products—*sigh* it never gets old! I could go on…but my love of autumn takes me all the way until mid-December! But with all there is to look forward to within the next few weeks, it really shouldn’t come as much of a surprise that autumn is my SECOND favorite season…just the foods alone are exciting, and then you factor in the great activities both on and off-campus—it’s definitely keeping me busy! Okay, you’re probably wondering, “What is student affairs, anyway?” It’s not a career path most college students have heard of before, like being a journalist, lawyer, or teacher. Well, you might be aware that Hofstra has Division of Student Affairs, which is comprised of 16 offices that “work together to promote student learning, growth, and success, in and out of the classroom.” The people who work in these offices are student affairs professionals. They include academic advisors, residence directors, counselors, and deans, just to name a few. They are all people who are working to support you and promote your success as a student. If you have served as a Resident Assistant, Orientation Leader, or Welcome Week Coordinator, for example, roles in which you were helping, advising, and programming for students, then you were doing student affairs work. So how does one pursue this field? First, there is no one career path that needs to be followed in order to work in student affairs. Student affairs professionals study a wide variety of majors as undergraduates and hold many diverse interests (a quick survey of some of the folks in my office revealed majors in psychology, communications, and business). Most people fall into student affairs by accident because they were very involved in college and realized they could continue this type of activity as a professional. Some pursued other career paths, but realized they missed the college environment. Though there are some exceptions, most entry level student affairs jobs require a masters degree (typically in areas such as higher education, college student affairs, or counseling), so advanced education is something you should consider if you wish to pursue this field. Typically, you can work as a graduate assistant while you are studying, so you can gain related work experience at the same time you earn your degree. 1) Set up a 15 minute informational interview with a student affairs professional to learn more about what they do. You should already know at least one, because they serve as your Advisement dean, your club advisor, or your Residence Director. People love to talk about what they do and are generally flattered to hear that someone wants to enter their field, so don’t be shy about reaching out! 2) Visit The Career Center and speak with a career counselor. They can help you clarify your goals, interests, and skills and help you better understand if this field would be a good fit for you. 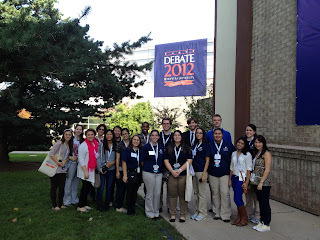 3) Visit the field’s professional organization websites to learn more about student affairs. There are regional, national, and international professional organizations related to student affairs that help set standards for the field, offer training and development, and provide a forum to discuss important issues within the profession. Two of the largest of these organization are the American College Personnel Association- College Student Educators International (ACPA) and the National Association for Student Personnel Administrators (NASPA). 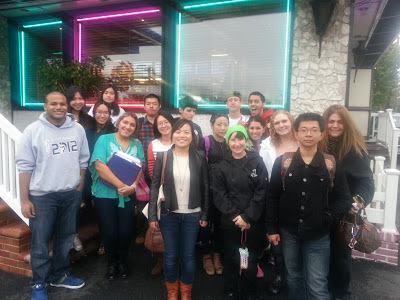 4) Research graduate preparation programs in the field to see what degrees are offered and the courses they require. If you are still reading this then perhaps we will be colleagues one day! I wish you luck and fulfillment in whatever career path you choose! 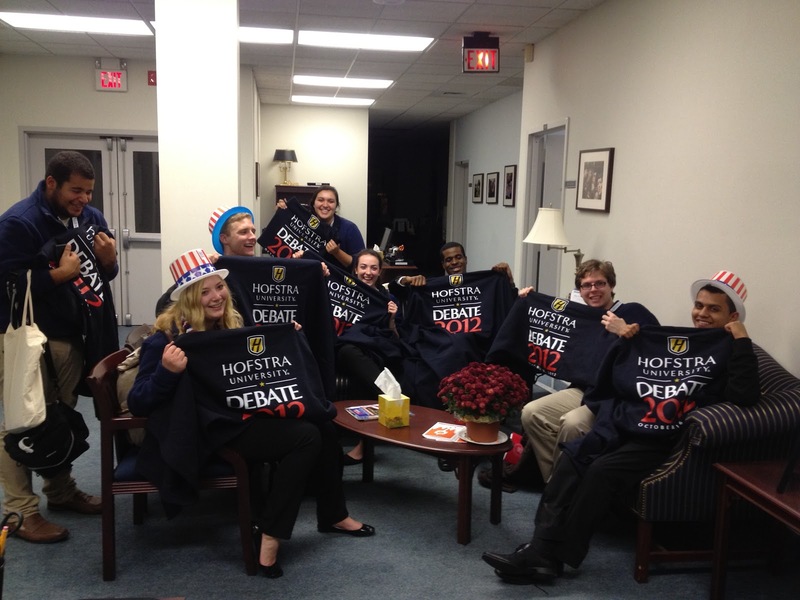 This past Wednesday signalled the beginning of Presidential Debate season, and Hofstra students are warming their pipes in preparation for when Hofstra gets a chance to host its own Presidential Debate, this year's second, on October 16. SGA Members start us off with the first of what will be 10 performances of our National Anthem. Each weekday leading up to and including the debate, students from various on-campus clubs will sing the Star-Spangled Banner during Common Hour in the Student Center Atrium. SGA got the festivities going with a rousing rendition of our National Anthem on Wednesday, 10/3. The Intervarsity Christian Fellowship continued in grand style yesterday, 10/4, and today we were treated to a lovely performance from the Hofstra Gospel Ensemble. 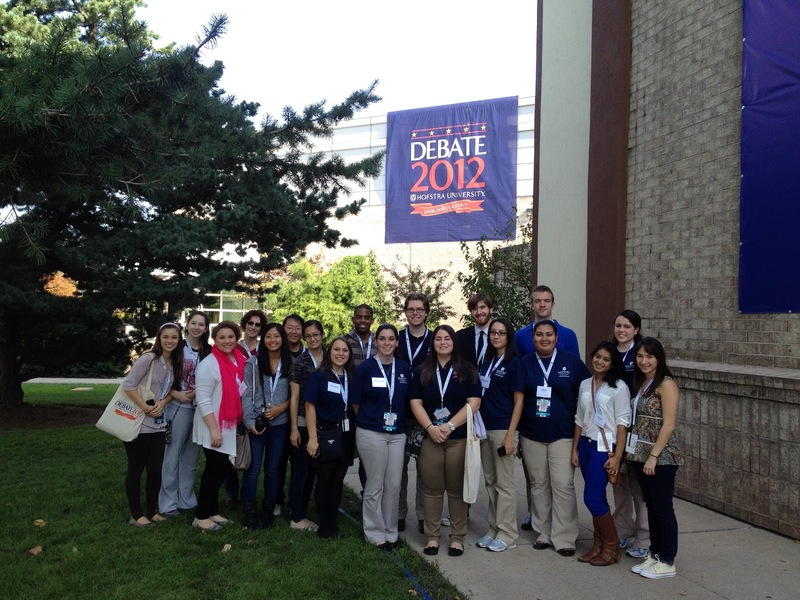 The Intervarsity Christian Fellowship shows its pride 12 days before the debate. The Hofstra Gospel Ensemble treats the Student Center to their rendition of the Star-Spangled Banner earlier today. Make sure to keep a look out every day, Monday through Friday, in the Student Center Atrium around 11:10 a.m. leading up to the big night on October 16. Catch your peers showing their pride in our great nation as we near this momentous occasion. 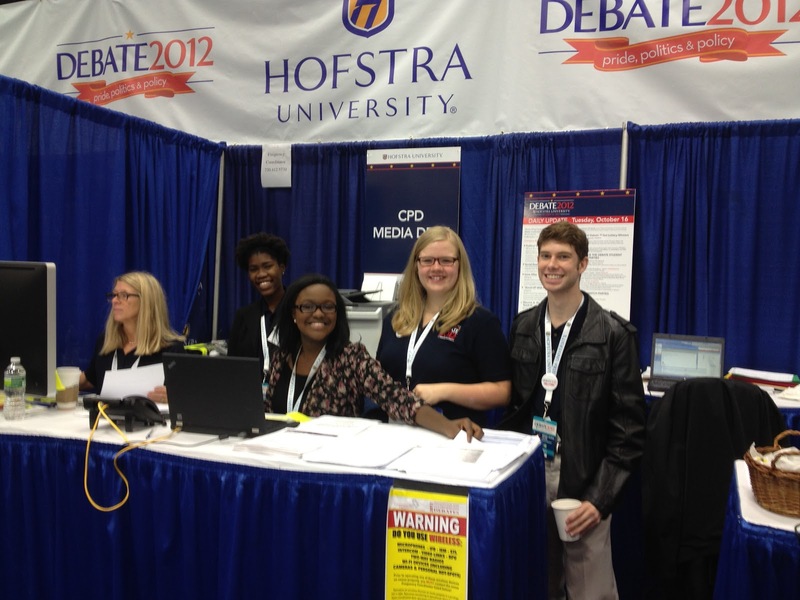 Also, be sure to check your Pride email accounts and visit the Debate 2012 website in the coming days to get the latest information on debate events. At the reception, participants were able to learn about famous LGBTQ role models through various informational posters presented throughout the room. The Pride Network provided interesting facts about LGBTQ pre-20th Century history. In addition, Queerocracy, a grassroots organization in NYC working to promote and realize social and economic justice through activism and education, presented information about issues some members of the LGBTQ community are thinking about this election season. 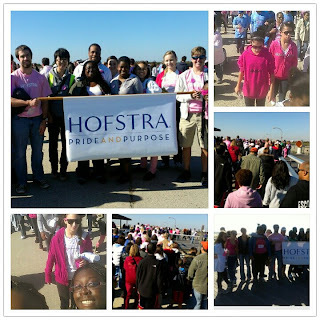 We, at Hofstra University, are proud to be an institution that advocates for our LGBTQ community and also hosts a strong Pride Network student organization. We strive to not only highlight LGBTQ events throughout our heritage month, but also throughout the year. However, it is important to recognize that this month is special in that we will be joining others across the nation to celebrate and advocate LGBTQ history, equality, and acceptance. As members of the LGBTQ community traditionally cannot learn about their history at home or in school, the nation-wide LGBT History Month was created to celebrate the key people who aid in the LGBTQ equality movement, to foster community between those who identify as LGBTQ or as allies, and to educate the public on LGBTQ civil rights issues, intercultural sensitivity, and acceptance. I encourage you to look at our LGBTQ Heritage Month calendar. Show your support of our LGBTQ community by participating in our events throughout the month.